Dupont Tyvek aprons are made of Tyvek 400 fabric material. Tyvek 400 garments are composed of flash spun high density polyethylene which creates a unique, non woven material available only from DuPont. They provide an ideal balance of protection, durability and comfort, and offers an inherent barrier against particles (down to 1.0 micron in size). Protection is built into the fabric itself; there are no films or laminates to abrade or wear away. Tyvek delivers consistently better barrier, even after wear and abrasion. Bib style with bound seams around neck. Case Count: 100 per case. 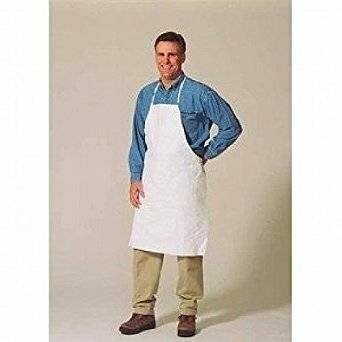 Safety Zone 1 Mil Polyethylene Aprons White or Blue 28" X 46"